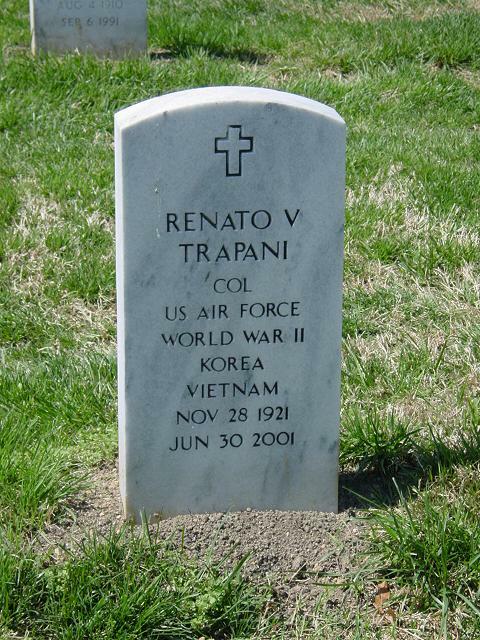 Renato Victor Trapani, 79, who spent 27 years as a logistics officer in the Air Force and retired as a colonel in 1978 at Air Systems Command at Andrews Air Force Base, died of cardiac arrest June 29, 2001 at his home in Crofton. Colonel Trapani was born in Italy and moved to New York with his parents in the mid-1920s. He was a marketing graduate of Fordham University and received a master's degree in business administration from New York University. He was a graduate of the Air University at Maxwell Air Force Base in Alabama. He was in the Army during World War II, serving in General George S. Patton Jr.'s Third Army and participating in battles at Normandy and the Ardennes. After the war, he was in the Army Reserves, and in 1951 he was commissioned a second lieutenant in the Air Force. He was a veteran of the Korean and Vietnam wars and was the recipient of the Legion of Merit and the Bronze Star. Colonel Trapani settled in the Washington area in the early 1970s. After retiring, he was an independent consultant for military retirees in logistics, personnel and education. He did volunteer work for Republican Audrey E. Scott's unsuccessful 1981 congressional challenge against Rep. Steny H. Hoyer (D-Md.). His memberships included the Lido Civic Club of Washington, the Sons of Italy in Annapolis and the Sovereign Military Order of the Temple of Jerusalem. His wife, Dorothy DeVan Trapani, whom he married in 1951, died in 1992. Survivors include two daughters, Victoria Trapani and Nancy Harper, both of Bowie; a sister; and two granddaughters. On Saturday, June 30, 2001, of Crofton, MD. Beloved husband of the late Dorothy D. Trapani. Loving father of Victoria A. Trapani and Nancy J. Harper; grandfather of Kathleen and Elizabeth Harper; brother of Yolanda Minnehan. Mass of Christian Burial at Fort Myer Chapel, Arlington National Cemetery on Monday, July 30, 2001 at 12:45 p.m. Interment Arlington National Cemetery. In lieu of flowers memorials may be made to the Sons of Italy, Annapolis, MD or the Military Order of the Knights Templar.